Thanks to gapmedics.com for this quiz. Enjoy! You’re a competitive, spontaneous exercise machine. You thrive testing your abilities against others whether it be on the track or at the gym. You’re confident in your abilities and don’t mind being around others when working out but prefer to focus on your own development. You prefer to be alone when you exercise and predominantly use it as a way to decrease stress. The perfect work out is one that not only keeps you fit but also centres you. Do you like to be spontaneous? What is your biggest motivation to exercise? Would you say that you’re an outgoing person? Do you prefer group or solo activities? Are you a compulsive worrier? Certain stories set an entire newsroom buzzing, and word of the death of Elvis Presley, 40 years ago today, spread like wildfire throughout the St. Louis Globe-Democrat. I had worked there for eight months, still getting used to the rhythms and quirks of the city’s lesser known newspaper. I stood far outside the inner circle of managing editors, city editors, feature editors and others who made decisions about what was and was not newsworthy. That, incidentally, would remain true for my entire, five-year tenure. Curiosity grew quickly about the details surrounding Presley’s death, but that wasn’t what had everyone talking. Instead, rumors spread quickly that the G-D brain trust wanted to relegate the story inside, probably with the obits. 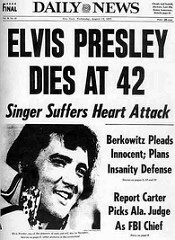 I was 27 at the time, and Elvis had been part of my life for 21 years. I had family near Memphis, and I had visited Graceland several times as a kid. 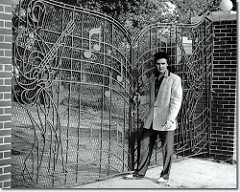 I stood outside the gaudy gate at Graceland as the Elvis mafia distributed autographed pictures of the King. As a 6-year-old, I felt torn between my mom and dad. Mom, being a Southerner, wanted to watch Elvis’s 1956 appearance on the Ed Sullivan Show. Dad found him crude, but he told me I could make up my own mind about whether to watch. The night of Elvis’s performance, I split the difference, standing in the doorway between the kitchen and the living room, fully committed to neither my dad, smoking in the kitchen, nor my mom, seated by the TV. I loved Elvis’s performance, though. Within a year, my dad had died of a heart attack. I was devastated, of course, but free of this little bit of tension between my parents. Like most people my age, by the time Elvis died, I saw him more as kitsch than King. The jumpsuits, excessive weight, botched lyrics, and endless cover songs made him a caricature of his former self. I celebrated his comeback in 1968, but nine years later, the magic had disappeared. Even so, my fellow reporters and I knew that keeping Elvis off the front page would be a mistake. He, Frank Sinatra and the Beatles changed the landscape of popular music in the 20th century. His legion of fans would never understand. In the end, the Globe-Democrat decision makers relented, and Elvis got his rightful place on Page One. I’ve come to understand just how much a person’s judgment is shaped by when he or she comes of age. When Elvis died, he had been on the scene a bit more than 20 years, but he wasn’t part of the fabric of the lives of the Globe’s senior management, just as Taylor Swift is not part of the fabric of mine. I have no understanding of the passion her fans have for her, so I have a bit more insight into how the Globe editors underestimated the importance of Elvis’s death. Like me now, they were just doing the best they could. A postscript: About a month later, Bing Crosby died. His front-page obituary was never in doubt. I worked eight years for Fleishman-Hillard, one of the world’s premier public relations agencies. During that time, I often thought we ran the world, and I’m being only slightly facetious. On any given day, those capable of digging behind the headlines often would find that F-H played a role. We drove a wide array of issues, from fighting increased beer taxes to saving manatees, from speaking out for riverboat gambling to urging America to “change your clock, change your batteries” (smoke detector batteries, that is). Fleishman-Hillard provided both the brains and the muscle to drive success for a wide variety of clients. 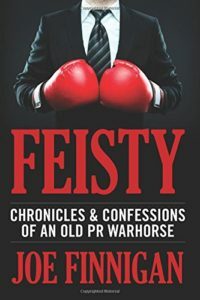 Joe Finnigan’s memoir, Feisty: Chronicles & Confessions of an Old PR Warhorse, talks about the rise of Fleishman-Hillard from an influential player in St. Louis to an international public relations power with 80 offices worldwide, 2,600 employees, and annual billings of more than a half billion dollars. The book, however, primarily tells about Joe’s successes and setbacks and the personal and professional lessons he learned during 35 years in the PR business. Joe played a huge role in the growth of Fleishman-Hillard. As a major cultivator and curator of the Anheuser-Busch account, he helped Budweiser and the company’s other brands win the beer wars of the 1970s. Joe’s systematic, strategic takedowns of the company’s major competitors, Schlitz and Miller, showed that, if necessary, public relations can be a blood sport. At the same time, Joe demonstrates how much working in public relations can be like walking a high wire without a net. Capricious clients can love you one day and eat you for breakfast the next. PR pros also can serve as convenient fall guys, as Joe learned after one, fairly innocuous misstep with Anheuser-Busch. Joe is stunningly honest about his clients and brutally honest about himself. He discusses his struggles with alcohol, his marital difficulties, his long estrangement from his children (since resolved), and his quest for the World War II soldier-father he never knew. Feisty is a must read for anyone who wants back stories about how headlines are made, issues are won, and quirky personalities can shape our world. Go here to buy the hard copy of Joe’s book or here for the Kindle edition.